I have known Feliciai for a couple of years, as she started her small business in the studio complex where I have a studio and sells at the local farmer's markets here in Oakland (CA). When she had her studio in our building, she would always leave out samples and other free products to a point where I felt like I had a lifetime supply. She moved on to a bigger space because her business was growing. I finally used up the last delicious bar of (free) soap, so I thought I'd like to use my $10 to support her and her generosity. 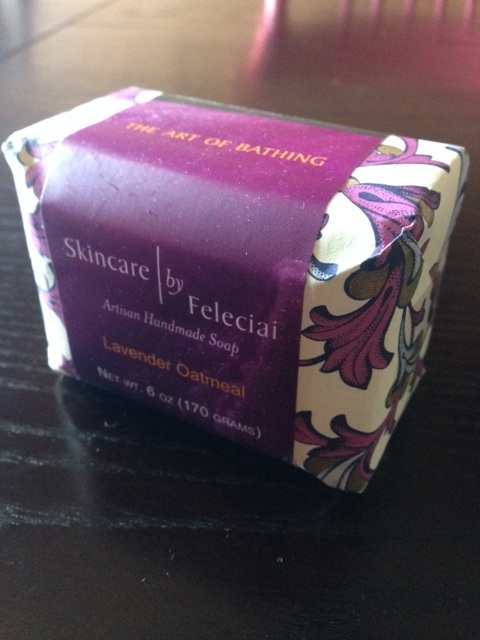 I bought a chunky, milky, purple-swirled bar of Lavender Oatmeal soap. She gave me another free sample with my purchase! She was open to the premise of the project and wondered if this was the same group that had supported black-owned businesses for a year. I wasn't sure if it was.